End hunger and ensure access by all people, in particular the poor and people in vulnerable situations, including infants, to safe, nutritious and sufficient food all year round. Families with children accounted for 43% of food bank users in Quebec in March 2016, of which 23% were two-parent families and 20% were single-parent families. 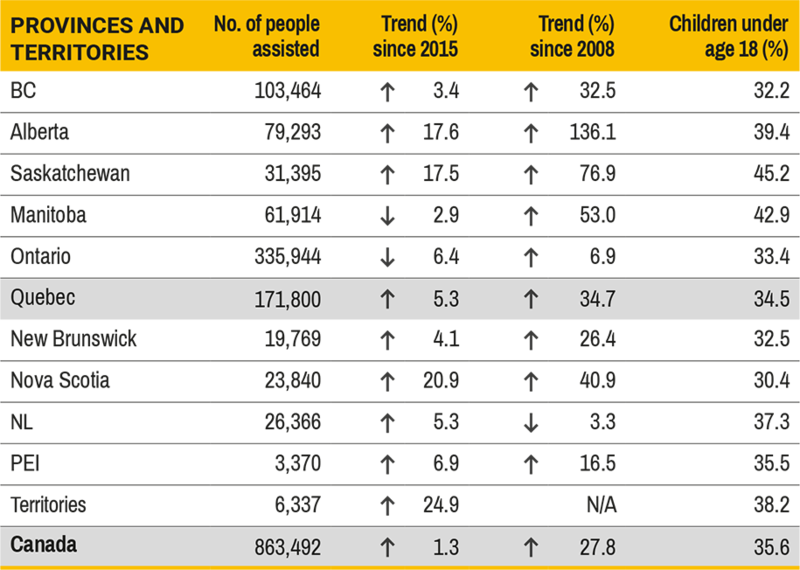 The Montréal region is noteworthy for having the largest number of beneficiaries of food assistance programs, as of March 2016, with some 150,000 people assisted each month. The largest percentage of households receiving help for the first time was seen in Laval (22.5%). Nearly 35,000 children under 18 received help from food assistance programs each month from Moisson Montréal, Moisson Laval or Moisson Rive-Sud (Table 2.1). When we add in the benefi ciaries of other programs offered by the food banks, such as meal and snack distribution, cooking workshops and collective kitchens, then the number of children receiving assistance rises above 35,000. Of the people who rely on food banks, children and young people make up a disproportionate number. More than a third of Quebecers who received food assistance in March 2016 were under 18. Nearly 60,000 children were served by food banks in Quebec, and over 300,000 in all of Canada. 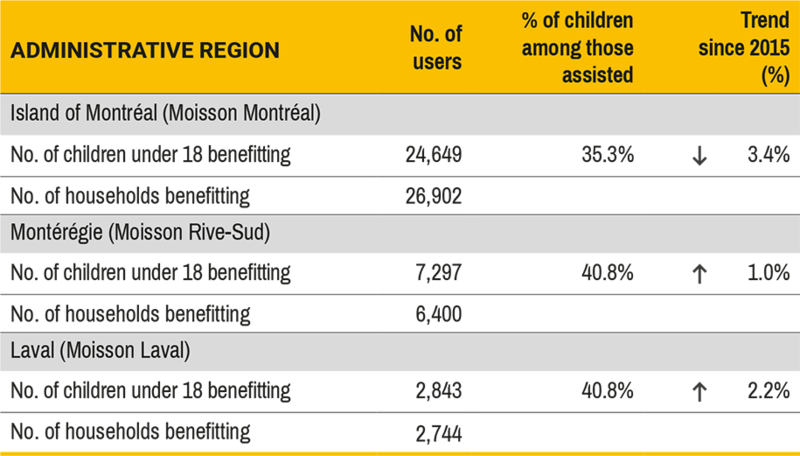 The proportion of children assisted in Quebec is comparable to the national trend (Table 2.2). Users of food assistance programs offered by the Moisson Montréal, Moisson Rive-Sud and Moisson Laval food banks, March 2016. SOURCE : Food Banks Canada (2016). Hunger Count Quebec 2016.
covering 60% of its territory. Use of food banks in Canada, March 2016. SOURCE : Food Banks Canada (2016). Hunger Count 2016. NOTE : The data, compiled from March 1 to 31, 2016, was collected from community organizations and food counters. In 2011–2012, approximately one Greater Montréal household in 10 experienced moderate to severe food insecurity, meaning that they consumed food of insuffi cient quantity or quality, mainly due to a lack of fi nancial resources. This was the highest proportion of food insecurity in Quebec (Figure 2.1). The most affected populations are families with children, low-income individuals and renter households. SOURCE : Statistics Canada. Canadian Community Health Survey, 2011–2012. Data taken from the Institut national de santé publique du Québec (INSPQ) (2014). L’insécurité alimentaire dans les ménages québécois: mise à jour et évolution de 2005 à 2012. Government of Quebec, Surveillance des habitudes de vie, No. 4, 11 p.
End all forms of malnutrition. According to the Québec Health Survey of High School Students (QHSHSS) conducted in 2010–2011, 54% of high-school students have breakfast before school each morning, as compared to 62% for all of Quebec. A mere one-third of students eat the minimum number of portions of fruits and vegetables recommended by the Canada Food Guide. 6 portions/day for ages 9–13, and 7 to 8 portions/day for ages 14–18. In 2010–2011, two-thirds of high school students were a normal weight. Approximately 15% of high school students were overweight and 7% were obese. The situation was comparable in Quebec as a whole. More boys than girls were overweight.